Discover the history and the vision behind our original concept of made-to-measure clothing for men, where the perfect marriage of traditional tailoring and technological innovation results in the perfect fit. 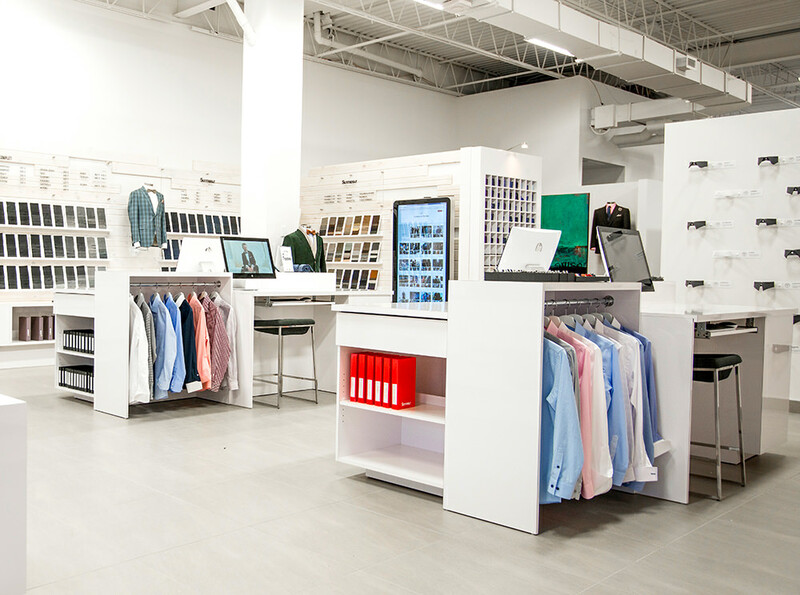 After two months of research and design, brothers Vincent and François Thériault launch a business offering a new shopping experience in a 300-square-foot store in Quebec City. Their concept is an instant success, so much so that the boutique quickly outgrows its space! A move and expansion in June 2011 allows Surmesur to welcome Quebec City clients in a more accommodating 1,200-square-foot space. Thanks to word of mouth, the company enjoys rapid growth over the following year. Surmesur establishes a second, more spacious and modern boutique in the heart of Montreal. 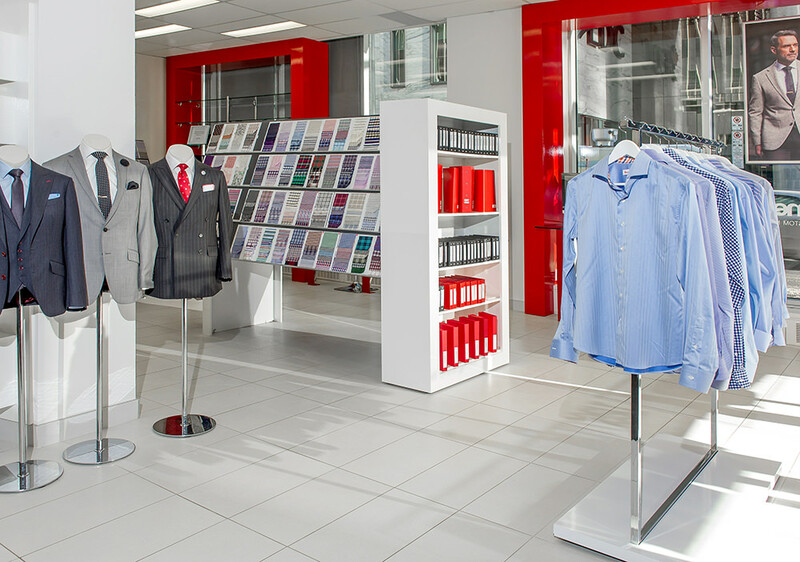 Surmesur adds a third boutique, this time in downtown Toronto, coinciding with the launch of surmesur.com, an online store that gives clients the tools to design shirts directly online. A fourth boutique opens its doors in downtown Ottawa. At the same time, the administrative team doubles in size, requiring a major reorganization of the Quebec City offices. The company’s fifth year of operations is brimming with change, notably thanks to a new collaboration with a world leader in the manufacturing of made-to-measure clothing. With an improved product and the desire to serve its clientele in a more welcoming environment, the company decides it’s time to give the Quebec City boutique a facelift. 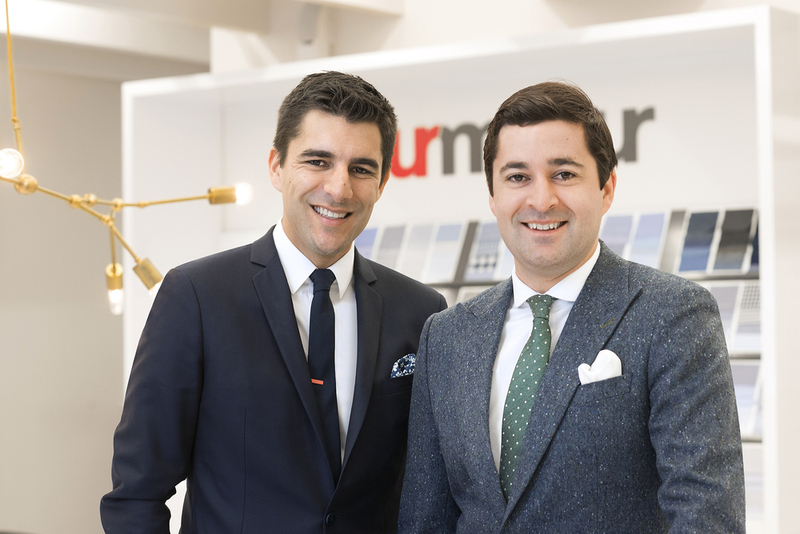 In autumn of the same year, Surmesur sets up shop in Laval in order to meet the growing demand in the Montreal region. Finally, a major addition to the shopping experience: a new ordering software application, The Studio, is introduced in all Surmesur boutiques. This new application allows the client to see the finished product before placing an order. Try it now! 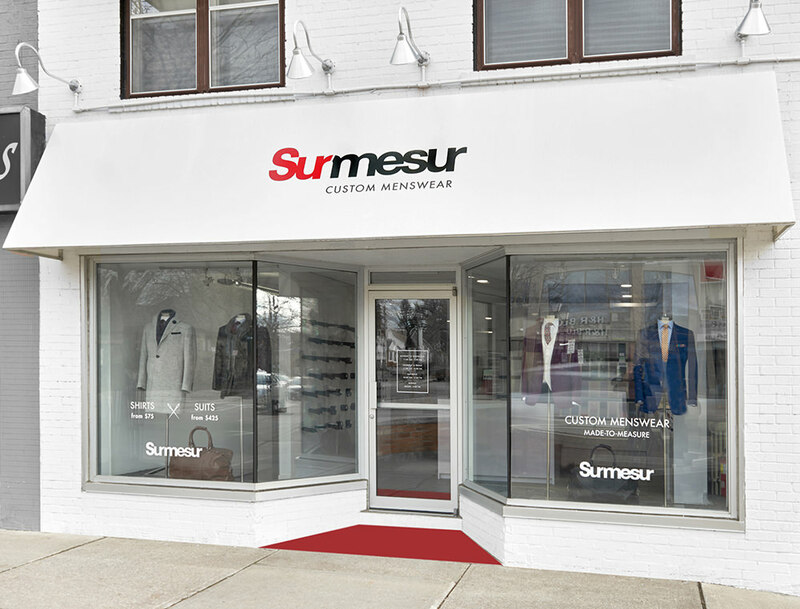 In 2016, Surmesur takes the next big step in its ongoing expansion across Canada with the opening of a store in Mississauga - a move that comes a few weeks after the opening of the company's first US locations, in Chicago and Pittsburgh. The same year, Surmesur launches a new transactional website, empowering our clients to create and order their made-to-measure clothing online. To be men’s favorite shopping destination where customers are cherished and employees are treasured. 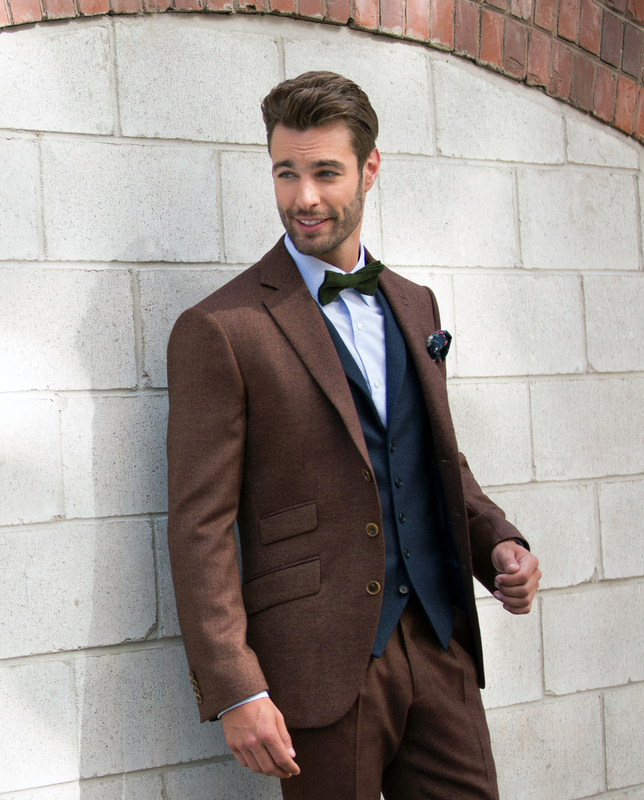 Surmesur's mission is to offer the most exceptional shopping experience and clothing that men love to wear. That's why we want to be men’s favorite shopping destination where customers are cherished and employees are treasured. Thanks to our emphasis on creativity, the Surmesur team sets the standard in our industry. Our goal is to surprise the client by constantly putting innovation at the heart of our product and service. Technological innovation is a key element of our success. It is important for Surmesur to be proactive, both in our service and our follow-up, and the company must know how to take the initiative both internally and externally. We are convinced that by being adventurous, we improve the experience of each of our clients as well as the efficiency of our service. At Surmesur, we put all of our efforts into meeting our objectives while maintaining an enjoyable work environment. For Surmesur, it is important to remember to have fun! Since its inception, Surmesur has been actively involved in the communities where we live and work, most notably by participating in events and fundraising campaigns. The tie for prostate cancer is a perfect example of this commitment. 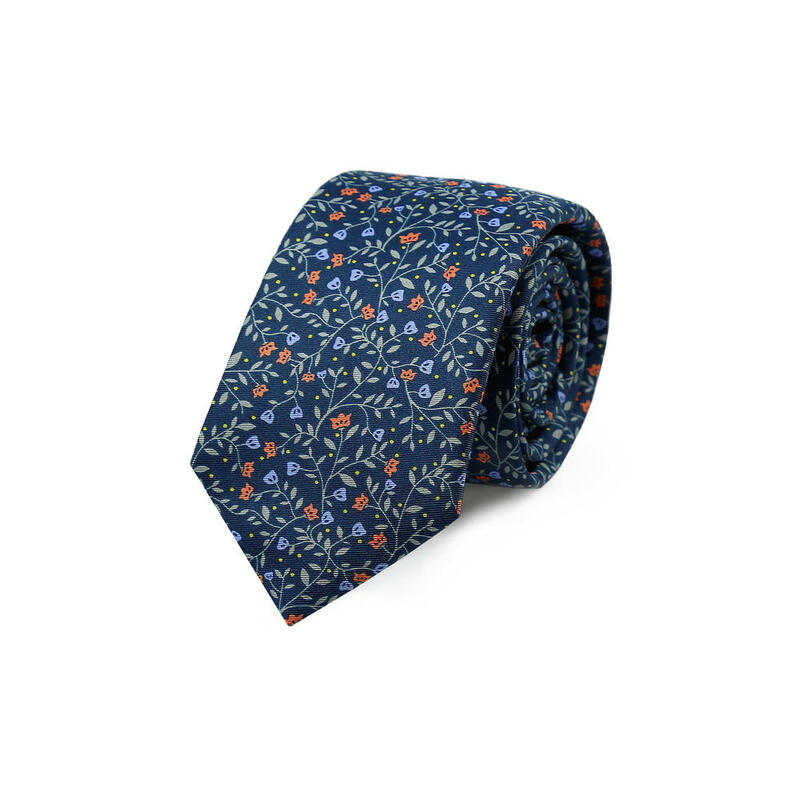 Every November, Surmesur creates a necktie that it sells throughout the year to raise funds for prostate cancer research. In 2015, other men’s accessories were added to appeal to a wider public and to generate even more funds for research. In addition, Surmesur encourages all of its employees go get involved in a variety of philanthropic activities in their communities. Surmesur receives a large number of partnership proposals. Due to our limited budget, we must therefore make some difficult decisions. Our sponsorship policy is to study requests on a case-by-case basis while giving preference to those that meet certain criteria. 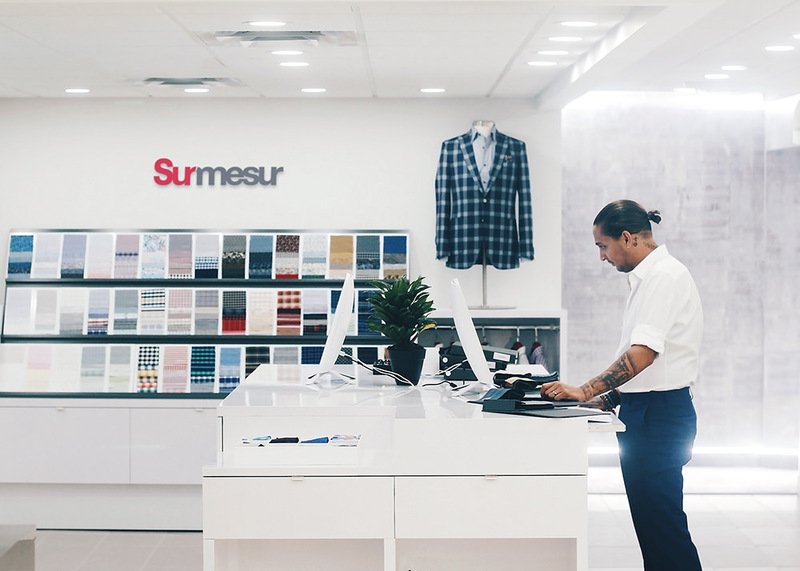 Surmesur is an original concept-boutique that allows men to wear distinctive shirts and suits, tailored to their measurements, manufactured to their tastes, and offered at ready-to-wear prices. 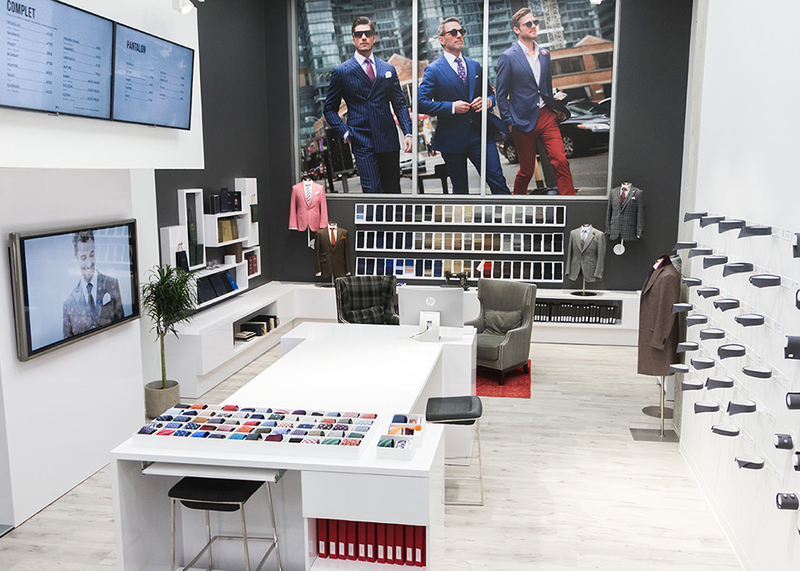 We offer a unique shopping experience in four easy steps: choosing among more than 10,000 fabrics; selecting the cut and other options; having measurements taken; and fitting. Our online design tool, The Studio, even lets you see your creation before you order it. You will receive your masterpiece four to six weeks later. If any adjustments are required, our in-house tailors will take care of them at no cost to you. This is your classic storefront location where we offer the signature Surmesur experience: Style Consultants help you design and order your made-to-measure clothing using state-of-the-art software, Measurement Specialists ensure the perfect fit, and expert tailors put the final touch on your custom creation. Otherwise known as a shop-in-shop, this is like a miniaturized version of a regular Surmesur Store located inside a larger retail outlet. 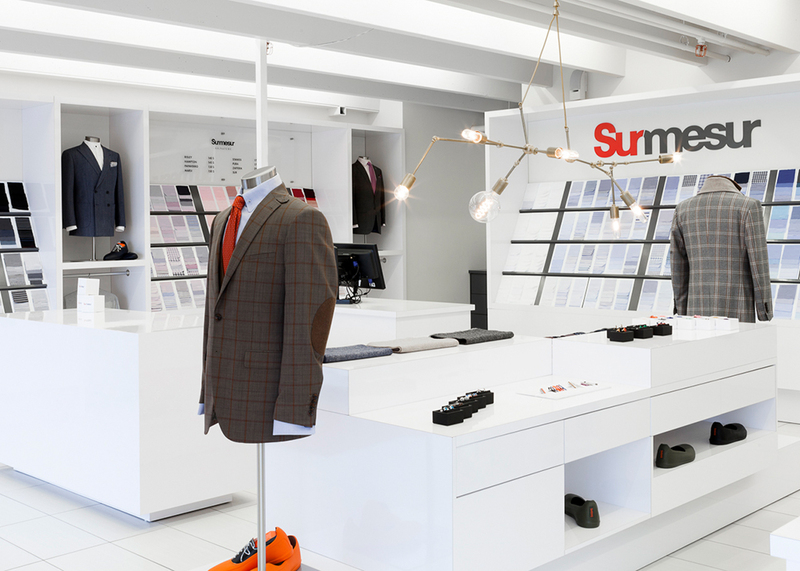 It gives you the opportunity to enjoy the in-store Surmesur experience even if you don’t live in an urban area with a full-fledged Surmesur store. When you can’t come to us, we come to you. Surmesur On the Road offers you the same distinctive products and services at your home or office, by appointment. Surmesur combines tradition and innovation by offering you the opportunity to create and order your made-to-measure clothing using our online creation software we call The Studio. Come see our Measurement Specialists to get measured, create your online profile, and place future orders from the comfort of home!